Thanks to the Severn Rivers Trust BART were lucky enough to acquire eight roach spawning boards recently in readiness for this seasons spawning. We hope that we can encourage the roach to spawn as successfully as the very famous Avon Roach Project on the Hampshire Avon. 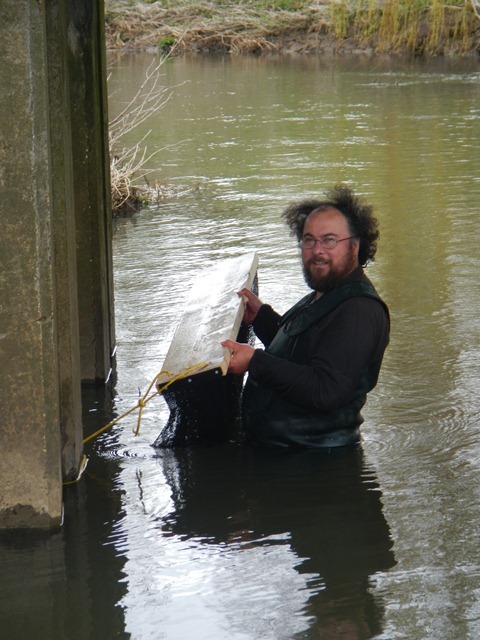 We will not be taking the spawning boards out of the river to separate rearing ponds as happens on the Hampshire Avon project and so we have taken special care in the siting of the boards so that the alevins have the best chance of survival. The “below the surface” part of the roach board. For best results we have been advised the boards need to be in the river by 22nd April each year and we managed this thanks to a very swift consenting process from the EA. The boards need to be sited where there is a good flow but also with due consideration for what sort of habitat is needed once the eggs hatch. Once hatched the alevins drift into the bank and attach themselves to vegetation where they live for a short while consuming their egg sac. Once this is done they detach themselves and drift into slack warm water where they continue their development. Bart’s boards are sited on the tips of flow deflectors built two years ago.The slacks which have developed behind these deflectors are ideal for development post hatching. They can also be attached to trees or bridge supports as long as consideration is given to the needs of the alevins once hatched. Siting the board next to bridge supports. We will monitor the boards regularly and hopefully the project will not only benefit the roach population of the stretch but also inform us for next year and a wider roll out of the technique.